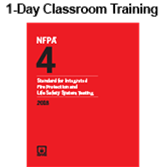 New from NFPA® - Get a full day of in-depth training on NFPA 4, Standard for Integrated Fire Protection and Life Safety System Testing. Learn about integrated system testing and why NFPA 4 application is so critical in your work. Referenced in the 2018 editions of NFPA 101®, Life Safety Code®, NFPA 1, Fire Code, NFPA 5000®, Building Construction and Safety Code®, the International Fire Code, and the International Building Code, NFPA 4, Standard for Integrated Fire Protection and Life Safety System Testing is your go-to source for help preparing integrated system testing plans. To fully understand NFPA 4 requirements, you need to know what Integrated System Testing is, why it is important, and how it will impact the safety of buildings and the ultimate success of your projects. Designed by experts, this activities-based course demonstrates correct application of NFPA 4 on various scale projects. By the end of the course you'll be able to explain the purpose of the Standard, identify members of the integrated system testing team, be aware of factors that contribute to an integrated system test plan, evaluate an input/output matrix, and understand the nuances encountered when applying NFPA 4 to both new and existing buildings. This course is an essential add-on for anyone attending the 3-day NFPA 72®, National Fire Alarm and Signaling Code (2016) 3-day Classroom Training. Do you think you're already performing integrated system testing? View our short, interactive tutorial to find out. Earn 7 hours or 0.7 CEUs for this 1-day NFPA 4 Classroom Training. Attendance is required to earn CEUs. Please verify applicability with your professional board or organization before attending. Ask for the National Fire Protection Association (NFPA) rate at any of these local hotels.